Definition - What does Ardha Malasana mean? Ardha malasana is an asymmetrical squat that is a variation of malasana. It provides a strong stretch and release for the lower body, particularly the inner groin. The name comes from the Sanskrit, ardha, meaning “half,” mala, meaning “garland” or “necklace,” and asana, meaning “pose." 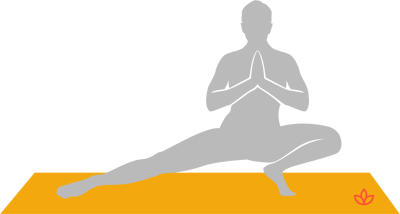 In this asana, one leg is in the standard squatting position, balancing on the toes with the hips releasing down, while the other leg extends out to the side. The hands are in prayer position in front of the chest. Ardha malasana may be referred to in English as half squat pose. In addition to its physical benefits, ardha malasana is said to be calming as it releases tension from the lower body. Traditionally, ardha malasana, like malasana, is associated with the muladhara chakra. Working with this chakra is said to help increase feelings of security, groundedness and trust. This asana can also be practiced as part of the Chandra Namaskara or Moon Salutation sequence. In this sequence, a flowing version is practiced where the body moves fluidly from one side to the other. This sequence is thought to be good for preparing the body and mind for sleep.